The best rifle borescopes money can buy pay for themselves in no time, even beyond the way you maintain your firearms. Traditional barrel-cleaning methods are time-tested and never to be neglected. An interior survey with a borescope will lay bare in no uncertain terms just how thoroughly your care regimen has maintained your gun’s working condition or, in a worst-case scenario, damage and obstructions that may diminish its accuracy or even shorten its lifespan. When not in use giving you an up-close, detailed tour down your firearm’s muzzle, you have an equally handy tool for inspecting vents, drains, pipes, crevices inside walls, and any other nook or cranny too dark, deep, twisted, or narrow for a naked eye to peer inside. Lyman Products Borecam Digital Borescope with Monitor – It isn’t entirely a “knock” against the Borecam to call it a decidedly simple device. That being said, it’s a no-frills choice. The solid 24-inch rod with miniature camera technology fits any barrel up to a 20 caliber. In addition to its handheld display, you can also export photos to its SD slot for later uploading and viewing. It is one of the rare borescopes designed specifically for firearm inspection. 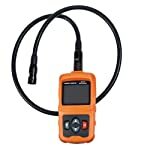 Teslong NTS150RS 3.5 Inch LCD Screen Handheld Borescope – The Teslong NTS150RS steps up from the Lyman borescope with an ergonomically designed 3.5-inch QVGA LCD with one-hand controls and conveniently backlit silicone buttons. The viewer is joined by a TF card slot that accommodates up to a 32GB memory card and a micro USB connection for storing and downloading captures. A total of six adjustable LEDs light the way for the waterproof probe and tube carrying a water-resistant 5.5mm camera head with an integrated flashlight. Depstech Wi-Fi Handheld Borescope – For advanced technology alone, Depstech’s best-selling borescope weighs in the heaviest. In lieu of an LCD, the iOS and Android compatibility of its included Wi-Fi apps enables you to stream and upload captures to any computer, tablet, or smartphone. It also features browser support for BlackBerry and Windows operating systems. Its three-meter cable features a handy articulation and relay system for more versatile viewing in tricky structures, topped with an 8.5mm camera and six adjustable LEDs. Depstech Wi-Fi Handheld Borescope – By the numbers alone, the Depstech is a respectable borescope. Its 60-degree viewing angle falls short of the 90-degree perspective gunsmiths ordinarily prefer but still angles nicely to look up and inspect rifling. It also delivers a relatively deep 60-100mm depth of field and its unique flexibility makes it moderately easier to look all the way around the barrel. It isn’t bad. It just isn’t exactly the best in this category among our choices, either. 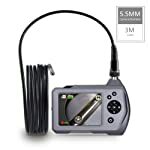 Teslong NTS150RS 3.5 Inch LCD Screen Handheld Borescope – The Teslong’s best focus comes between ¾ and 1 ½ inch but captures usable images at any distance, despite a shorter 3-6cm depth of field. It matches the Depstech’s viewing angle and the crystal-clear 3.5-inch color LCD makes up for any lack of clarity, but it truly sets itself apart with a 4X zoom and 360-degree rotation that sheds light on any potential blind spots for more detailed examination. Lyman Products Borecam Digital Borescope with Monitor – As counter-intuitive as it might sound, this category surprisingly belongs to the simplest borescope of our trio. Teslong and Depstech’s cameras both sport cables several meters long but Lyman tailored theirs specifically to one purpose with a simple two-foot rod. Its 90-degree viewing angle leaves nothing lingering in a blind spot. It doesn’t flex or tilt. I wasn’t left with more cord to deal with than I needed. In this one sense, it was exactly what I needed. Lyman Products Borecam Digital Borescope with Monitor – Unfortunately, the very characteristic that makes the Lyman Borecam so appealing hinders its actual resolution. Adhering to such a no-frills design left little room for the hardware that improves the Teslong and Depstech cameras’ captures. The poor quality of its photos may not necessarily do justice to wear, throat erosion, tool marks, and other damage – you know, the very things you pipe a borescope down a barrel to look at more closely. 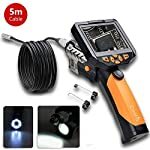 Teslong NTS150RS 3.5 Inch LCD Screen Handheld Borescope – The Teslong’s six LEDs keep the barrel well-lit for the 300K-pixel VGA camera. In turn, it displays both images and video in adequate 640×480 resolution. You won’t miss a thing between the admirable field of view and par-for-the-course resolution of this borescope. In this instance, however, it doesn’t rule the category. Depstech Wi-Fi Handheld Borescope – It isn’t the Depstech’s 2MP CPOS alone that gives it the edge here. That’s par for most respectable borescopes. Its six LEDs are a match for the Teslong and easily better overall illumination than the Lyman Borecam provides. However, it really comes down to simple numbers and only this device offers variable resolution settings. In fact, even its minimum 800×600 resolution exceeds the best quality the Teslong’s monitor has to offer, let alone the Depstech’s additional 1024×768 and maximum 1280×720 settings. 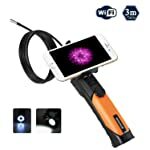 Depstech Wi-Fi Handheld Borescope – Not that I have anything against Wi-Fi capability in a borescope itself, but we are talking about pure ease of setup. In this case, it can become an aggravating complication as quickly as it can make you wonder how you ever managed media without it. Yes, it makes efficiently viewing, uploading, and storing data incredibly convenient. However, should something go wrong, it can render the device basically useless if you cannot connect to a computer, tablet, or smartphone. Lyman Products Borecam Digital Borescope with Monitor – There is just nothing simpler. It’s a rod with a camera and the whole rig is attached to a display. Turn it on. Slip the camera down the barrel. Rotate it as necessary to fully check out the state of things. Snap pictures as needed. It just doesn’t get any easier than that. Ultimately, the final decision didn’t go quite the way I expected. I didn’t think the Lyman Borecam would disappoint me, being made with firearms in mind, but where it succeeds in simple setup and usability, it fails in terms of being able to actually provide a decent picture of the inside of a barrel. I can’t believe I’m saying this, but it could have done with a bit more “complication” in the interest of higher-quality captures. Meanwhile, the Depstech has some interesting tech in place that made it hard not to appreciate its innovation. The variable resolution settings combined with quality lighting, some handy features for seamless data transfers via the included apps, and a flexible cable that makes up for its average viewing angle all make it my pick as the best rifle borescope for your money. This is the device I would trust not just to save me money caring for my priceless firearms but to transition right into aiding with my home-improvement projects in between. Honestly, I don’t really know much about borescopes. I like the fact that you said, though, that this thing can actually “root out small problems” even before they become big. It must be one great piece of equipment. I specifically like the Depstech WiFi Handheld Borescope because of its 60-degree viewing angle which can definitely capture a lot of images when in this type of position. I love capturing photos, so I thought this one comes closest to the camera I’m currently using. Anyway, I’ll probably read some more about borescopes and their advantages in today’s modern technology. Thanks.